French people love food. And I am no exception. I love all food, from Norwegian to Pakistani, from reindeer to vegetarian, from fish to mezza (small dishes from the Middle East, usually eaten in high number in one meal, and shared among all the guests).Oslo offers a wide range of restaurants for all tastes. Here is a list of my favourite restaurants in Oslo. Note: None of these places has either paid me or asked me to do advertisement for them. This is an honest, non interested recommendation based on taste and quality. My aim: sharing my love of food! L’Ardoise, located in Bislett. Foreigners usually want a French restaurant to have Edith Piaf music in the background and onion soup on the menu. Reality is that French people don’t listen to Edith Piaf all day long, otherwise we would all be suicidal. There is a lot of modern French music from French rap to pop, and a lot of modern cuisine which does not involved (only) camembert and baguette. 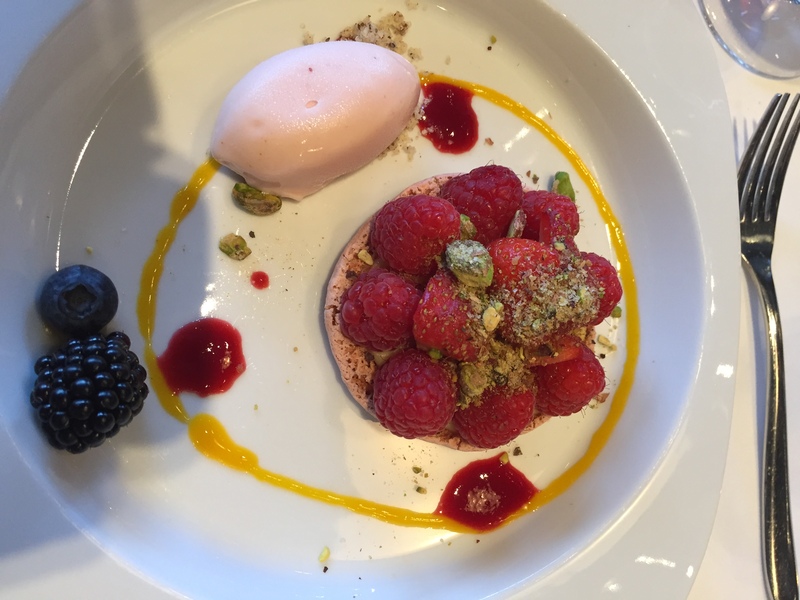 L’Ardoise has a chef which makes original first courses, main courses and desserts. The menu changes with the seasons and the chef’s mood and creativity, and nothing I have eaten there has disappointed me to date. A must try if you want to eat the French food French people like! The prices are completely affordable, especially for the high quality of the food and cooking you get. I advise to go there for dinner and choose the three course meal of the day. L’Ardoise also makes my favourite desserts in town: Their macarons are a killer (try their Café gourmand: a coffee and two macaroons of your choice), their cakes and desserts are also tasty and surprising. Try their dark chocolate mousse with yuzu and meringue almond crust. To die for. 2. My favourite vegetarian restaurant in Oslo? Without any hesitation The Fragrance of the Heart. It is a low key restaurant located behind Rådhusplassen as well as in Majorstuen. They have vegetarian and vegan meals of the day, from curry to lentil soups. All homemade, with fresh and clean ingredients. The place is held by a group of people who follow a guru, advocating for peace on Earth and meditation. They don’t try to convert you to anything, just holding their vegetarian and vegan cafés here and there, and promoting good healthy food at low price. Also check out their warm chocolate which is to die for. And their vegan cakes, especially their cherry pie and ginger ball (raw and vegan). And their homemade kambucha. The waiters are also the cooks, and they are all very kind and calm. The meal of the day changes almost everyday! 3. My favourite restaurant with a view of Oslo? Ekeberg restauranten and Frognerseteren restaurant. Both these restaurants are well-known in Oslo. I would recommend Ekeberg in the Spring and Summer, as it is more modern and urban (accessible with the tramway), while I would recommend Frognerseteren in the winter (in the middle of the forest in Nordmarka, roughly 40 minutes away from the city centre with the metro). With fireplaces all over, and an old fashioned but well maintained wooden house, Frognerseteren is a perfect place for a warm chocolate and a waffle after a skiing or sledge trip in Nordmarka. 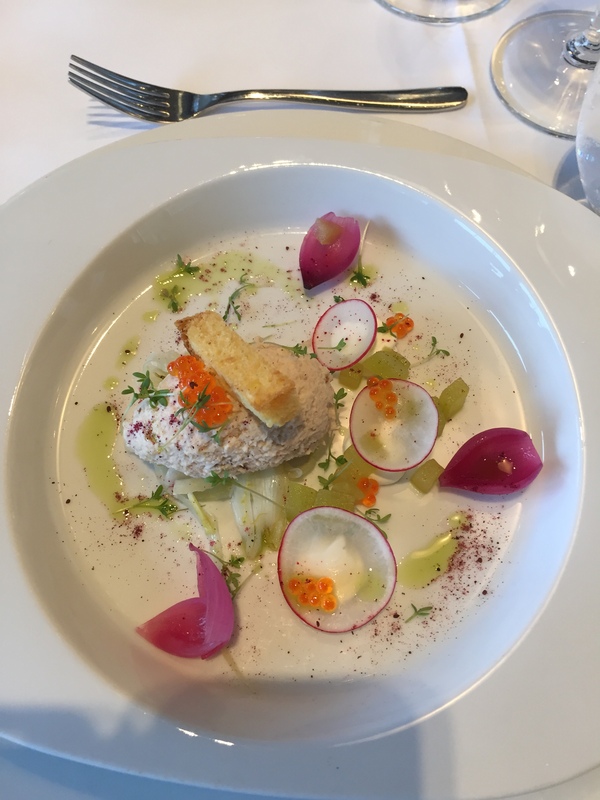 I recommend the Kafé Seterstua with its Norwegian cakes and smørebrød rather than the restaurant which is very expensive However a perfect place for a dinner paid by your company, such as julebord! 4. My favourite mezza restaurant? Here it was hard to choose. So I have two favourite mezza restaurants in Oslo: Habibi and Mela café. Habibi has been around for decades (it seems) and serves quality mezza, in a warm atmosphere. The prices can get a bit high if you take a lot of them, but all in all the quality is there, and it tastes yummy! It cannot be too exotic when one wants to taste something else than reindeer meat and Grandiosa pizza (no offence to Norwegian food). Mela café is new in town. It opened recently with Mela Huset organising a music and cultural festival as well as concerts and happenings. The café is just behind Rockefeller in the city centre, and serves tasty and cheap hot and cold, meat and vegetarian mezza. I also recommend the arabic coffee with spices. The atmosphere is laid back and more suited for a lunch, whereas I would go to Habibi for dinner. 5. The best pizza in town? So here it comes. My favourite Oslo restaurant for pizza is Lofthus Samvirkelag. The dough is thin and crusty, the toppings are surprising yet matching each other deliciously. They have a range of “white” and “red” pizzas. Try the Five cheese pizza, or the Reindeer from Røros with pomegranate. Or in the “red” range, the Parma with fresh ruccola. I cannot describe it, they are just so good. And look much better than the banana pizza from Bulgaria, I swear! 6. The best fish’n’ chips? Fish in general and fish n’chips in particular are excellent at Fiskeriet. This restaurant has been there for a while, right on Youngstorget, and serves fresh fish and seafood to clients coming in and out, and has a small dining area where they serve a delicious fish soup, fish n’ chips with the freshest fish you can remember and a nice crisp to it. To take away it is quite cheap (less than 120 NOK if I remember well). The sauce is delicious and homemade. 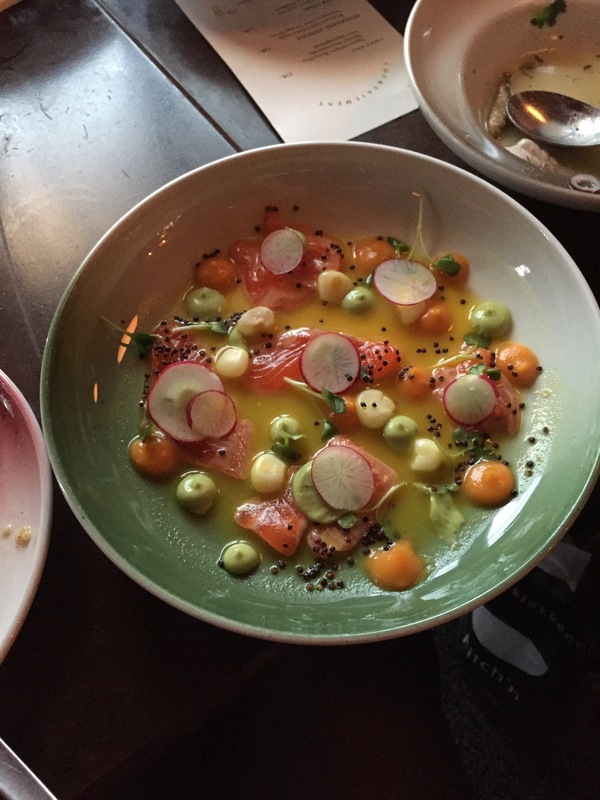 Peruvian food has been ranked best food in the world, and Oslo has its share of great Peruvian restaurants. A little high-end price-wise, but soooo worth it: Piscoteket close to Brugata. The best way to eat there is to go with a bunch of friends and to order several meals chosen by the chef. It is cheaper then and you get to taste almost everything. The ingredients are fresh and the mix of tastes is amazing. The cocktails are also to die for. 8. Best Pakistani restaurant in Oslo? Pakistanis are the second largest immigrant group in Norway after the Swedes, and they opened a lot of restaurants. But none is quite like Darbar, in Tøyen. It does not look that fancy, but it won the best Pakistani restaurant award voted by Pakistanis themselves living in Norway. And that has to mean something right? The tastes are wonderful, the sauces are homemade and the waiter has humour. What more could you ask for, really? I also heard of Der pepper’n gror (Indian) which is apparently amazing but on the higher end price-wise, very close to Rådhusplassen and The Fragrance of the Heart. Heading there soon to try it for myself. The Crowbar and brewery. Although this is originally a pub, with very good beers, it also has great finger food and kebabs upstairs. Perfect food to go with a beer or when one is slightly drunk. The kebab does not have unidentified meat like in those dodgy kebab places that bloom all over Europe. Here the meat is juicy, the sauces are tasty, and you even have an option to eat a whole baby roasted pig. The “Precious kebab” option is a “Wrap with roasted pork knuckle meat, salad, red beat, homemade creamy sour dressing”. Not exactly a traditional kebab, which is pork-free, but trust me, it is tasty. There is also a vegetarian option, with falafel. 10. 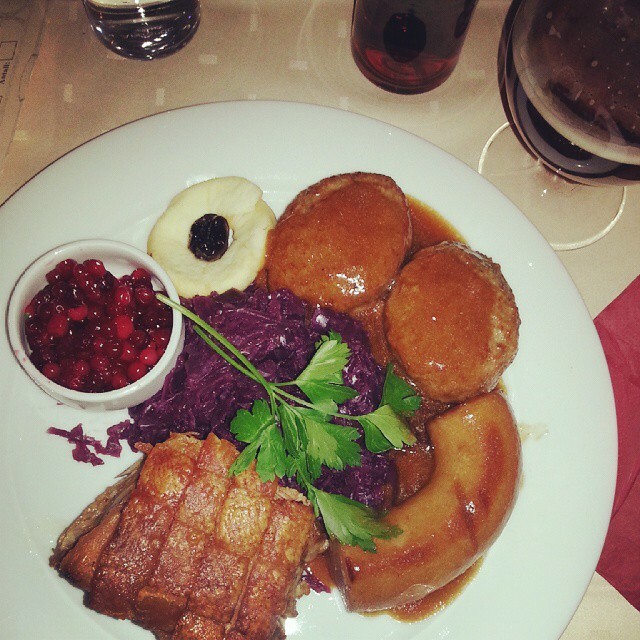 Best traditional Norwegian food? Last but not least. We are in Norway, and tasting its traditional food is a must. My favourite is Lorry’s, located next to the King’s castle. This place has the best traditional Norwegian Christmas meal I have tasted to date (we ordered ribbe and lutefisk). They have a fixed meal of the day, and seasonal menu depending on Norwegian traditions: fårikål, as well as reindeer burgers, cod etc. Their desserts are well-known, especially their apple cake. The price range is from not too expensive to quite expensive, depending on what and when (lunch or dinner) you eat there. But all in all the quality of the service and of the food is definitely worth it. Especially if you don’t have any Norwegian friends inviting you for traditional Norwegian meals yet. You have to taste it somewhere right? There are obviously many kinds of food missing here: Best sushi, best hamburger, best crêpes, best soups, best Italian restaurant, best Chinese, best Thai, best Indonesian… so much food on this planet! So much to taste! Let me know if you have other recommendations of restaurants in these categories, or other types of cuisine. But if you ask me the best food is the one we make at home, also in Norway. 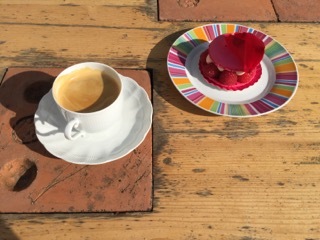 Here is a picture of a beautiful macaron made of rose and lichee cream which I ate at my parents’ home in Marseille, it is called an “Ispahan”. Bon appétit! 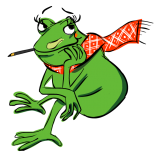 Want to read more from A Frog in the Fjord? I write regularly for the Norwegian newspaper VG as well as on this blog, and recently published a book (only available in Norwegian for now) entitled “En frosk i fjorden – Kunsten å bli norsk”. Get a signed copy here. What’s not to love in a post ALL about food!? 💙Great stuff! Very Informative! I am very foody and I can’t wait to visit these restaurants . I like the info provided by you. Thanks and keep sharing. Previous Previous post: Simone Veil, den mektigste franske feministen siden Simone de Beauvoir, døde forrige fredag.